Eric J. Sheffield is the co-founder and Principal Broker of the Sheffield Realty Group. The Sheffield Realty Group, headquartered in the Atlanta suburb of Mableton, GA opened in 2007 and is one of the fastest growing real estate brokerages in the metropolitan Atlanta area with over 30 licensed real estate agents. Prior to opening Sheffield Realty Group, Eric was an award winning top sales agent with a large real estate brokerage. Eric's sales success led to executive level positions within the company where he was responsible for the sales development and growth of several licensed agents. Eric has used this invaluable experience in the ongoing development of the agents affiliated with Sheffield Realty Group. 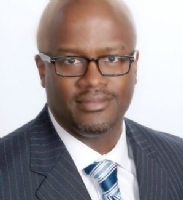 Eric has an accounting degree from Morehouse College and has over 15 years experience in various corporate finance and real estate development positions throughout his career.